Jan Griffin Farrington of Ridgeland is executive director of Medical Support and Development Organization Inc. She also serves on the board of directors for FNC Inc., Mississippi Technology Alliance, and Jeff Anderson Regional Medical Center in Meridian. Farrington graduated from the University of Mississippi in 1965 with a Bachelor of Arts degree in secondary education. She married the late Dr. Jeff Hollingsworth (BS 65) and began teaching political science and history in the New Orleans Public School System. She later worked as a customer service representative for Wachovia National Bank in Durham, N.C. After living in Washington, D.C. and Sunnyvale, Calif., she and Dr. Hollingsworth returned to Jackson. In 1987, she married Lawrence Farrington (BBA 58) and their mutual love for Ole Miss led them to become more and more involved in different areas of the University. She is past president of the Ole Miss Alumni Association, past chair of the UM Foundation and past chair of the Ole Miss Women’s Council for Philanthropy. She is currently serving on the Executive Board of the Alumni Association and The University of Mississippi Foundation Board. Farrington is a member of the Ole Miss Alumni Hall of Fame and served as president of the National Delta Delta Delta Foundation. She is an avid supporter of the American Heart Association. 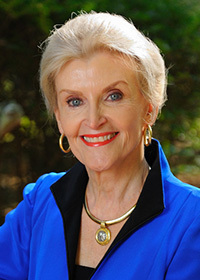 In 1989, she became the first woman to serve as chairman of the board of the Mississippi Affiliate of the AHA after serving as state campaign chairman in 1987-88. She has received both the President’s Award and the Heart of Gold Award from AHA. She and Lawrence live in Ridgeland. They have six children and 11 grandchildren.